Why do the majority of values fall in three main clusters? Q. I can not help wondering why the majority of values fall in three main clusters: Organizational, Self- Actualization & Emergent Order. Is this because this is where the majority of people are living their lives? Values build on each other. 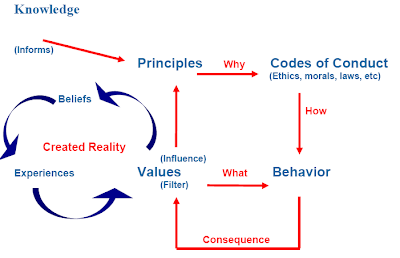 We have to experience certain aspect of life before the concepts associated with come values can emerge. The early values which emerge in our life are related to much simpler concepts than those which emerge later in life. As we move from childhood to adulthood there's an "explosion" of values which come into our consciousness as we find ourselves in relationship to ever expanding and more complex systems -- family, friends, schools, organization, society, eco-system, etc. This explosion explains why there are so many values in the organization, self-actualization, and emerging order clusters. Q. How does the balance affect individuals who do fall outside the norm? Does the tool accurately pick up such distinction? A. No. In order to determine the balance point between focus on self and focus on global transformation, the AVI's algorithm determines the centre of gravity of the values on the values map. This process is like children (each child representing a value) on a see saw. Those in the middle have less influence on the balance point than those at the ends (representing self-preservation or global transformation). Both size (= priority) and position matter. Large size (= high priority) has more impact on the balance point than the same size (priority) at the middle.